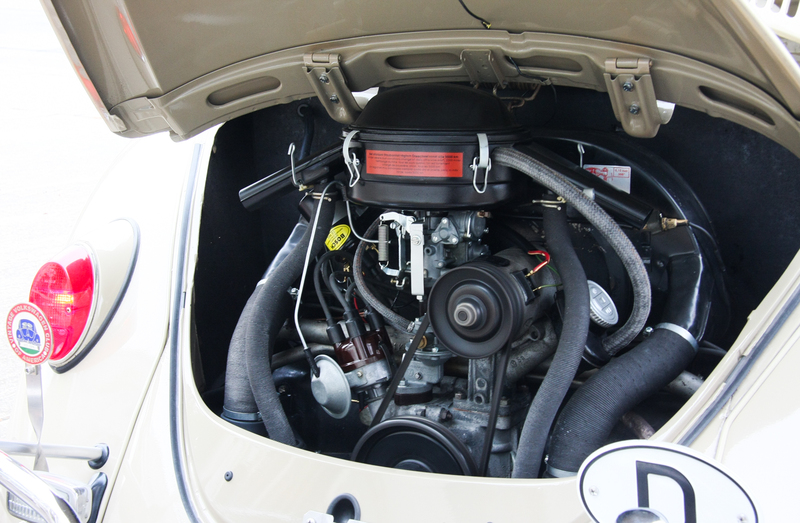 The Distributor of choice for the 1967 Beetle is the 113-905-205K. The 205K distributor’s advance is operated by a single vacuum. A tube on the vacuum canister is connected to a metal vacuum tube by a short length of vacuum hose. At the other end of the metal tube it is connected also by a short length of vacuum hose to the driver’s side brass vacuum inlet of the 30 Pict-1 (VW 105-1) Carburetor. 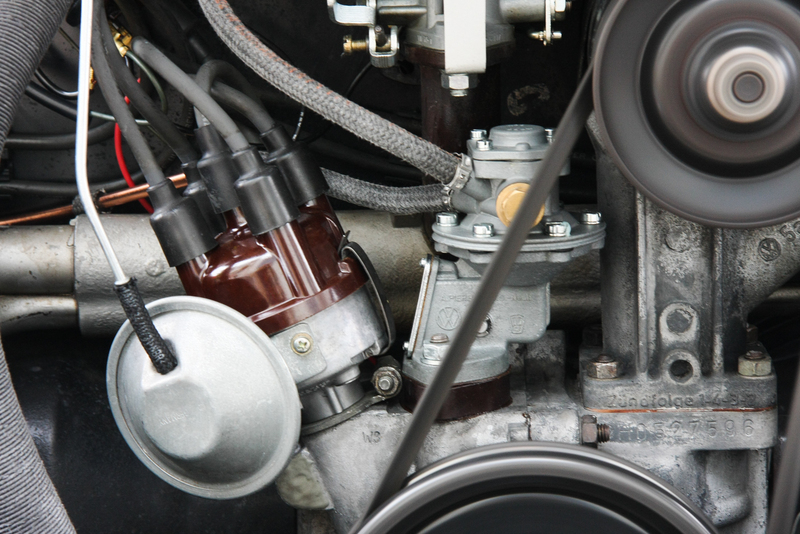 The metal tube is configured with a loop (like a large upside-down letter U) at the top at the vacuum port of the carburetor. This is to discourage any gasoline residual from being aspirated into the vacuum canister. Here’s a little history of the evolution of the metal vacuum tube. 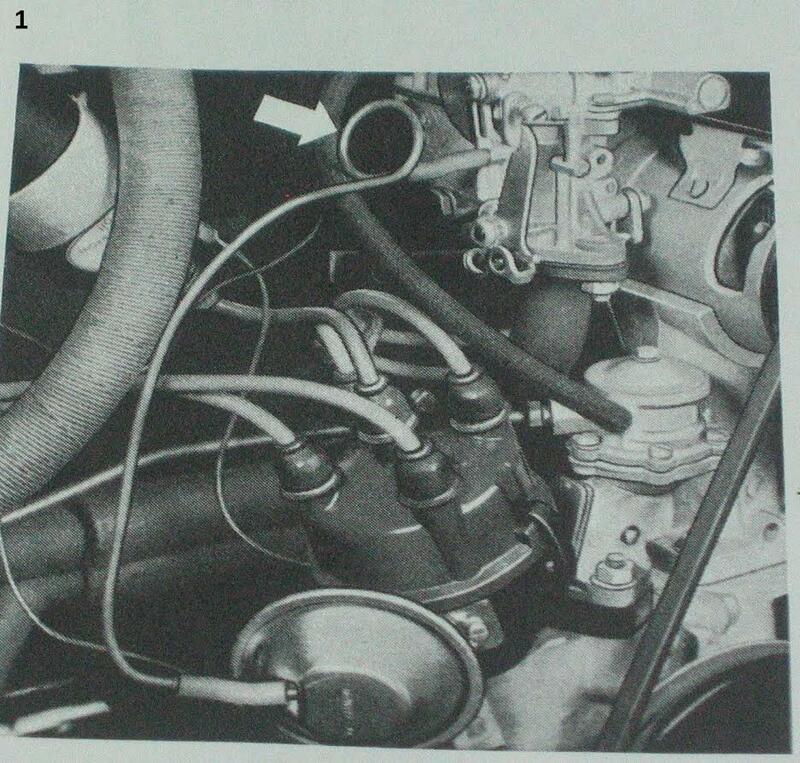 Into December, 1961, only a braided hose connected the vacuum canister directly to the carburetor. 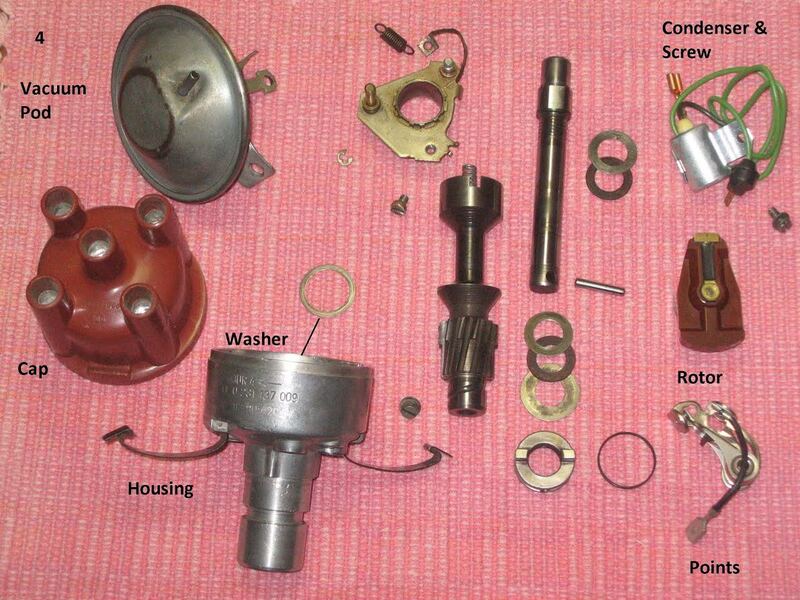 This was remedied during the month of December, 1961, with a kit supplied by or installed by VW dealerships. This kit was unusual in that a metal tube, formed into a loop as a complete circle, was connected by a 40mm length of braided hose to the carburetor vacuum tube and, at the bottom end, by a 40mm length of braided hose to the vac canister. This was to be a permanent installation. As well, there was a “service installation” which was a metal tube formed into a complete circle-loop which was an abbreviated version of the above metal tube. This tube was short on either end. 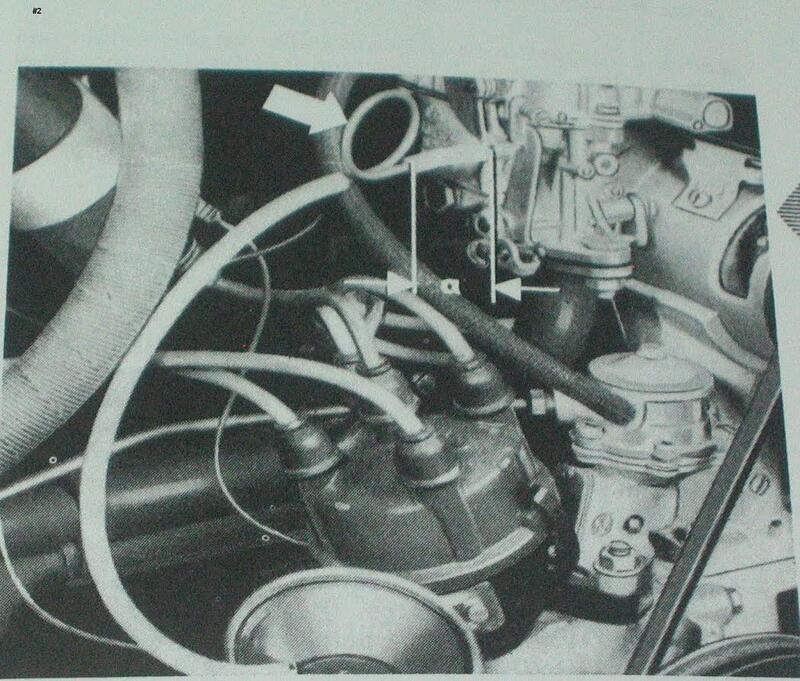 It was to be installed on previous years as a replacement for cars which were fitted only with the braided hose. 40mm was cut from the existing braided hose and the metal tube-loop was inserted between the longer end and the 40mm piece. As a “Service Installation”, dealerships could install a circular-shaped metal vacuum tube (with two short ends) for previous chassis/engine numbers. Eventually, VW simplified the circular loop into the upside-down “U” form of metal vacuum tube. Unfortunately, many of these original -205K distributors became worn and, rather than to be repaired, were discarded and replaced with other models of Bosch vacuum distributors or with mechanical distributors (such as the -009). As a result, the -205K has become rather scarce and examples almost always will need to be over-hauled before further use. Rust is an enemy of the distributor. Rust can pit the cam lobes and destroy the ability to stay in time. The pitting and scaring can cause the fiber block of the points quickly to become worn and the points will make irregular/ premature contact. It is supremely important at tune-up time to put that tiny dab of grease behind the fiber block to ensure proper lubrication and to prolong the life of the fiber block. I find that in order to rebuild a single example, I often must use parts from several distributors. What should be a quick and fairly simple rebuild can become a frustrating experience. I find myself hating to even think about a rebuild. Until a few years ago, Bosch sold repair kits for about $12.00. The problem was that each kit contained only one of the two fiber washer/spacers needed for the repair. I looked around and found similar fiber washers at the hardware and worked them so that they conformed to original washers in inner and outer diameters and of about the same thickness. The great difference was the “texture” of both flat surfaces of these hand-altered washer/spacers. The original fiber washers have a textured, or “quilted”, surface which accomplishes two purposes: to hold lubricant and to lessen friction (less surface due to the quilted pattern). That same Bosch kit now has sky-rocketed to about $40.00 each. I content myself with substitute fiber washers presently purchased from a source which provides washers of the same inner diameter as the originals and a slightly smaller outer diameter. The thickness is good. If you know of a German source for the original style washers, a lot of us would be happy to know about it! Please let us know! Eventually the fiber washer/spacers become worn and brittle and often disintegrate and disappear into “air-cooled-space”. With the worn and/or disappeared spacers comes too much vertical play (called axial play) in the distributor shaft. Performance comes to a halt and the distributor must be retired or rebuilt using replacement new or good used washers. The metal washers can be of varying thicknesses to absorb axial play until satisfactory play is achieved. 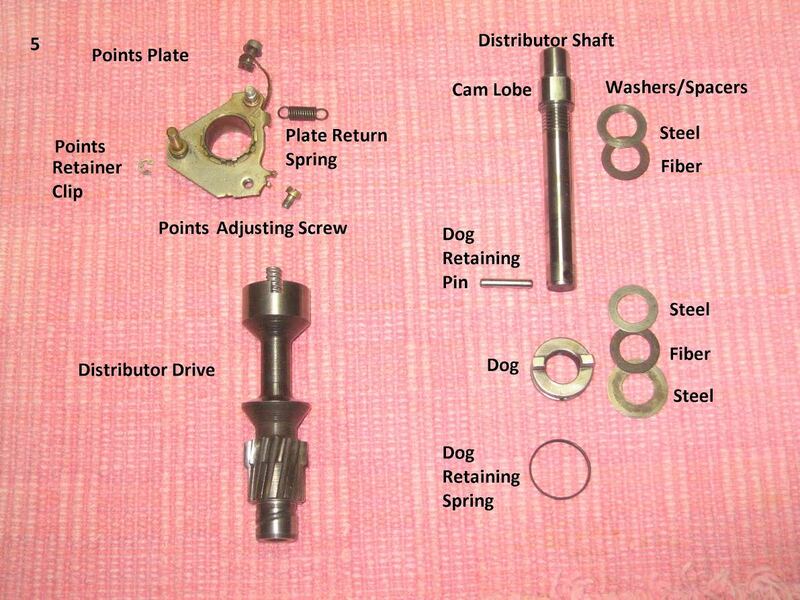 If a distributor is discovered to have too much radial play (worn bushings inside the “stem” of the housing) the distributor is to be salvaged for parts and the housing discarded. There appear to be no bushing replacements for these units. I rarely find too much radial play. The genius of German engineering designed the housing with two bushings—upper and lower. Between the two bushings there is a recess with a hole in one side of the housing stem which exits through the side of the stem to a vertical groove in the stem. 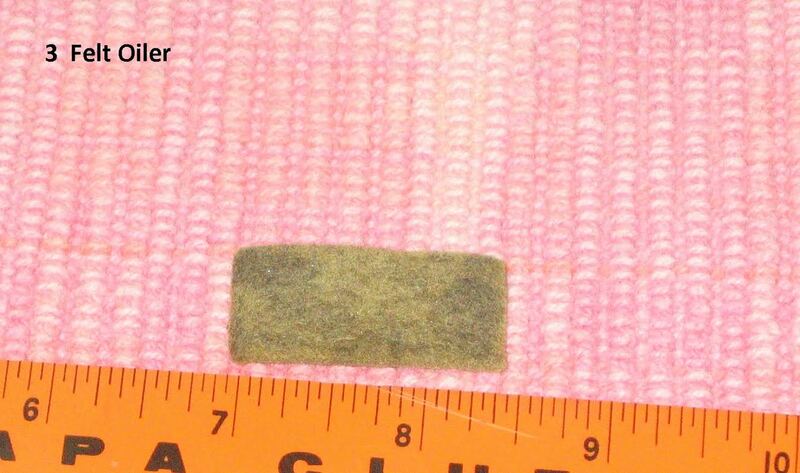 A felt pad is positioned in the recess between the two bushings. Oil from the engine is able to enter the distributor housing through the hole to saturate the felt oiling pad. This keeps the bushings and shaft well-oiled. I have disassembled many of these distributors and have come to conclusions about what goes where. I found that the Bentley’s Manual falls short when showing the exploded view of a disassembled -205K distributor. As a result, I had my faithful photographer to shoot my latest distributor project. I laid out the parts in some semblance of order to give an idea of the simplicity of these units while attempting to show the order of re-assembly. Special Thanks: To my Dear Wife, Neva, for patiently learning a new photo management program—then spending time practicing before embarking on the photos for this article. Glenn Ring (a moderator) on The Samba sells the correct (Bosch) fiber shims. He buys them from Germany. I’ve bought several from him while rebuilding some 205K and 205T distributors. One thing I’ve seen before on a “K” distributor while rebuilding them was the wrong vacuum can. The original “K” distributor vacuum can’s with the timing of 7.5BTDC had a “star” pattern on the back of them. They were replaced with a “T” vacuum can which has a timing setting of 0 or TDC. I’ve had both vacuum cans in my hands. The difference is how far the arm pull the advance plate. There’s a thread on The Samba that discusses these can differences as well. Another great article, Jay, I can’t thank you enough. If you can email me those photos, I could place them in this thread. I have a German source for them. Probably the same as Glen. You’re a Genius, my friend. If you ever think about moving, come South! Eric, here is the link to The Samba thread on the vacuum cans to include the “star” can. Jay, I figured you knew Glenn. I think I paid $5 bucks for the last two shims I purchased from him. It was a much better deal than buying two of the Bosch kits at $40 which only had one fiber shim. Those fiber shims shouldn’t cost anymore than $1 each. Everything to rebuild these distributors is now available at an affordable price. Hi i wonder if you can help me i have problem with a lack of power on acceleration . i static time to 7.5deg but when i put a strobe on and connect the vacuum hose the timing is fully advanced . So how dose the the engine spark in the right place if it can not advance any further ? HI Jay , Sorry i should have said , yes its a 67 1500 chassis number 117389970 . it came as a 6 volt but this summer ungraded to 12 volt alternator . Running all original 30 pict 1 carb and Bosch 113905205k dizzy. When i have asked on other forums and they say yes this is fully advanced at idle with the vacuum hose attached but if this is the case then how can it spark in the right place at higher revs? the car at the moment will not accelerate smoothly. any help or diagnosis tips would be gratefully accepted. points correct ,plugs correct, valves set at 6 thou, carb mixture 5 X 1/2 turns out from bottom. Thank you very much for your great article! It helped me a lot. I am in the process of rebuilding the exact same distributor and have a question regarding the axial play. What would be a satisfactory amount of axial play? With two steel washers and two felt washers I am getting 0.016 in. Sounds great! I will definitely do that once I’m done. Sadly the carb was replaced at some point with a Brsosol H30/31. I have an original 30 Pict-3 but I’ll definitely keep looking for the original 30 pict 1 (VW 105-1). Thanks to another one of your very interesting articles I learned that not all 30 Pict-1 are the same. Saved me from buying the wrong one.